Live casino games are always a popular choice among our players, and when it comes to live casino products, we only offer the best. From Live Blackjack to Live Casino Hold’em, you’ll find all of the famous table games in our Live Casino Lobby provided by Evolution Gaming, which can be accessed at the click of a button. But which one is currently proving most popular? We’ve taken data from the past two months to find out which of our live casino games has been played by the most people here at 21.co.uk. 21.co.uk isn’t all about Blackjack. In fact, the most played live casino game currently is Live Roulette. With high payout potential and simple rules, it’s no wonder that Live Roulette has accumulated 1,606 unique players since the beginning of September. But why is this game more popular than our other live casino products? It’s perhaps a combination of simplicity and winning potential that 21.co.uk players like when it comes to Live Roulette. All you have to do it bet on a number of combination of numbers and the dealer does the rest. The Roulette wheel has become an iconic staple of any casino, making Roulette an instantly recognisable casino table game. There’s also a lot of variety when it comes to Roulette bets, which further adds to its appeal. Sure, you can place a couple of side bets in Live Blackjack, but these require an additional wager. There’s a whole range of different bets, whether you’re using the number board or the racecourse, which are all standard options in roulette and don’t require you to make an additional wager on top of your main bet. The fact that Live Roulette is purely a game of chance can be off-putting to some, but the main draw for many. You never know where that ball will land and this is what players love about the game. Place your bets and let Lady Luck decide the rest. Of course, there are various roulette strategies you can experiment with which could help you lower your losses, if you prefer more strategic game of roulette. It’s no surprise that Live Blackjack is a popular choice here at 21.co.uk. It is after all our namesake. Though it may not take the top spot currently, 721 unique players is still pretty impressive. The main appeal of Blackjack is that it offers players a little more control than Roulette or Dream Catcher. Obviously, you have no control over what cards are dealt to you, but you can decide what to do with those cards. Hit? Stand? Split? Double down? The choice is yours, and many players enjoy the opportunity to implement some basic Blackjack strategy. Live Blackjack is another example of how Evolution Gaming have brought a classic casino table game to the online world. All of the basic functions needed are there, plus a few innovative features for you to enjoy, such as a built-in chat function and the ability to switch between camera angles. You may not have heard of Live Dream Catcher, or perhaps know it as Money Wheel. However, with over 400 players since September, it’s clear that this game is a hit at 21.co.uk. The concept is simple - place your bets and your croupier will spin the large vertical wheel. On the surface, it offers a similar concept to roulette which could very well contribute to its popularity. In Live Dream Catcher, the wheel is divided into 54 even slices. You bet on a colour of the wheel, and if the pointer lands on it when the wheel stops spinning, you receive a payout. Each colour corresponds to a number, however, there are two sections of the wheel which correspond to multipliers. This is what sets Live Dream Catcher apart from other casino games. 2x and 7x multipliers may be applied to your prize for great potential payouts. There aren’t many live casino games out there that offer bonus features or the chance to multiply your prize, which is most likely why Live Dream Catcher has become one of the most played live casino games at 21.co.uk. It’s also a fairly laid-back experience, in which the croupier does most of the work for you. You can sit back and chat with other players using the built-in chat window, and your croupier will chat with you throughout the game too. With 173 players between September and October, Live Casino Hold’em is clearly a hit among poker fans here are 21.co.uk. This is the world’s leading Live Hold’em Poker, so we’re not surprised to see it take a spot in our most popular live casino games. Players who love to take part in poker tournaments in real casinos are bound to enjoy Live Casino Hold’em as they can experience the game from their mobile, tablet or desktop device, whenever and wherever they like. Like Blackjack, Live Poker offers players a little more control than other casino table games as you choose which move you make next - stand, raise or fold. 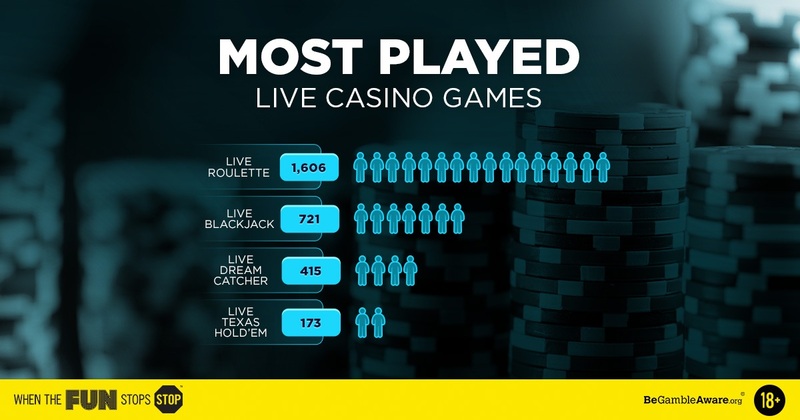 But why is Live Casino Hold’em more popular among players than Live Three Card Poker or Ultimate Texas Hold’em? It’s perhaps the combination of five card hands and a fairly simple concept that puts this game ahead of other live poker products in the popularity stakes. If you prefer to play against the dealer rather than other players then Live Casino Hold’em is the game for you. So there you have it - the four most popular live casino games currently at 21.co.uk. Join thousands of players at our premium tables for the ultimate online casino experience. Which game will you choose?